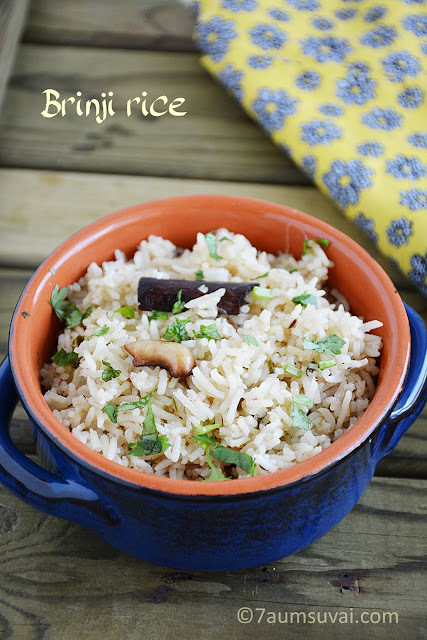 Brinji rice is a coconut milk flavoured rice that is quite simple and tasty too. It goes well with any spicy chicken curry or with any other vegetarian kurma. 1. 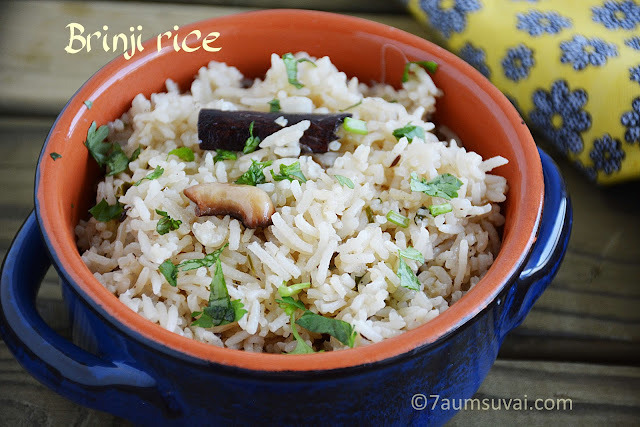 Wash and soak rice for 30 mins and set aside. 2. Heat oil and butter in a pressure pan / cooker, season with items given in the list for seasoning. Add onion and green chillies along with little salt, saute until they are slightly brown in color. 3. Followed by ginger garlic paste and chopped coriander and mint leaves (reserve little for garnishing), saute for few seconds. Now add soaked and drained rice, saute for a minute. 4. 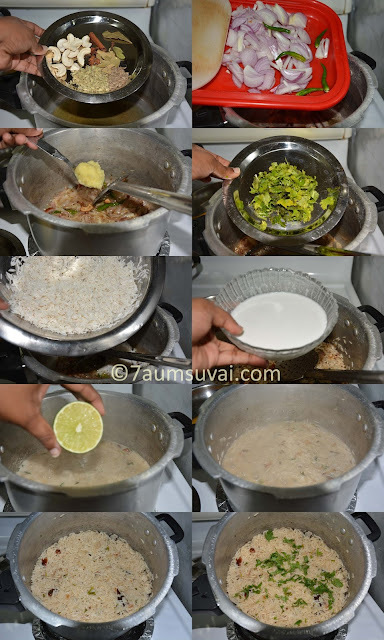 Pour in 1 1/2 cup of fresh squeezed coconut milk along with 1 1/2 cup water (totally 3 cups), lemon juice and required salt, bring it to boil and allow them to cook until rice is 3/4 done. Cover with lid and cook them for about 1 whistle or for 5 minutes or until well cooked. Allow them to cool completely. 5. Finally garnish with chopped coriander leaves and mix well. Serve it with any curry and raita. 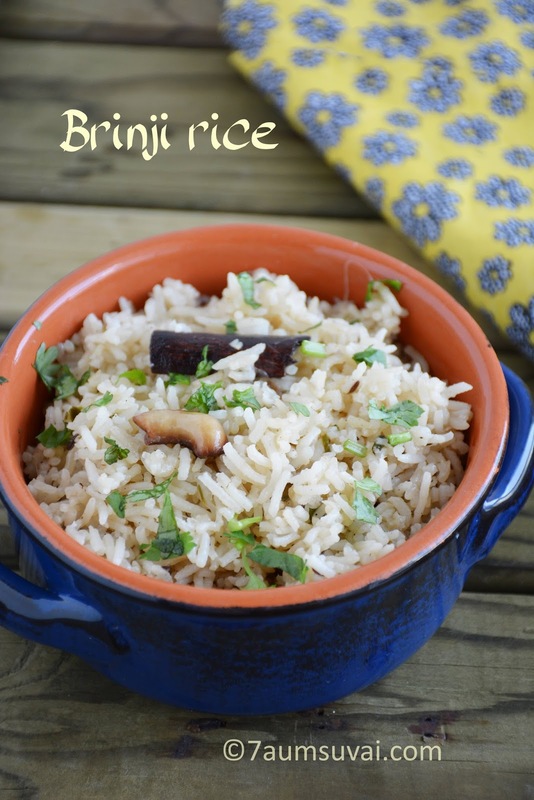 · Do not over cook or under basmati rice. Add perfect water ratio 1:1 1/2 and make it fluffy. · Increase or decrease number of green chillies as per your spice level. Missed your recipes and clicks for a month Shanthi!